PokerStars SportStar Neymar Jr hosted a charity Home Game last Thursday to help raise funds for his institute. A total of €52,300 was raised. 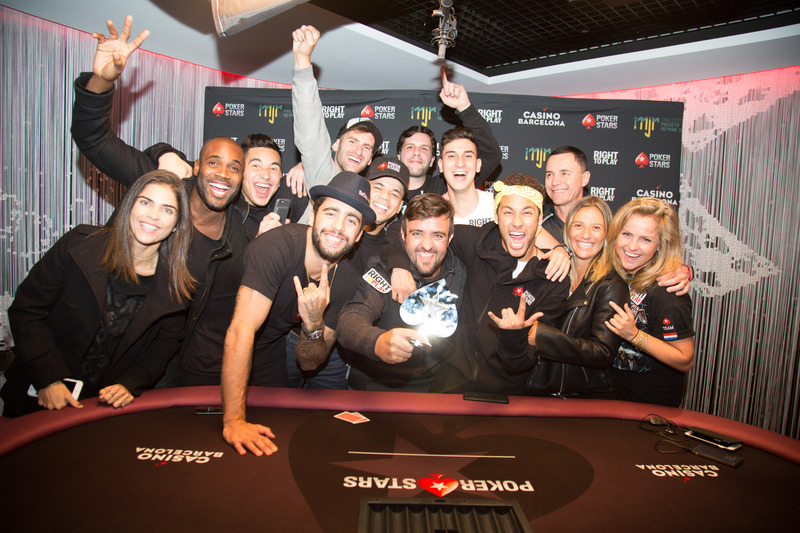 Online qualifier Diego Garcia Bello from Galicia, Spain, also joined the superstar footballer and friends for his first ever live poker tournament having won a place in the home game for free at PokerStars. The world class Sortis Hotel, Spa & Casino played host to the inaugural PokerStars Championship Panama, breaking the record for the largest poker event held in Latin America. There were well over 6,000 entries across the 46 events, with more than $9.3 million awarded in prizes. American Kenneth Smaron took down the Main Event after outlasting a 366-player field in the $5,300-buy-in signature event. Smaron joins Bahamas Main Event winner Christian Harder as Championship winners in the new era of global live events. The Sunday Storm 6th Anniversary exceeded its guaranteed prize pool of $1 million by $317,150, paying out 15,587 places. The winner was Brazilian ‘edg40’ who claimed $107,731. It was a good day for Brazil with 1,435 players from the country finishing in the money for a total of $329,016. Satellites to PokerStars Championship Monte Carlo Main Event and the $1 million guaranteed €1,100 PokerStars National Championship are currently running on PokerStars. On April 2, there will be a 25-package guaranteed satellite to the Main Event and a 10-package guaranteed satellite to the National Championship. Players also have the opportunity to turn €10 into a PokerStars Championship Monte Carlo package worth more than €8,500 by playing fast-paced, special edition Spin & Go tournaments on PokerStars until April 10. Early bird bonus: Players who buy their seat before April 1 for the PokerStars National Championship or PokerStars Championship Main Event will be eligible for Live Freeroll Flipouts that award the top two their buy-ins back. The Flipouts will run at 11:30am on respective Day 1A’s. First prize won by Kenny Smaron in the PokerStars Championship Panama Main Event. Smaron beat a field of 366 players to claim the largest payout and trophy from the $1,775,100 prize pool. Smaron’s live tournament earnings now top $1.24 million building on a €595,500 score at EPT12 Prague where he won the €10,000 High Roller beating a final table that included Dan Cates and Team PokerStars Pro Vanessa Selbst. PokerStars will make its way to the City of Dreams in Macau for its next Championship stop which runs March 30 – April 9. The National Championship will carry a HK$2 million guarantee and the Asia Open is guaranteed for HK$1 million. Players can qualify for these tournaments on PokerStars until Sunday. While there are plenty of chances to compete and win a PokerStars title, there will also be plenty of other exciting activities with members of Team PokerStars Pros during the 11-day series. Read more on the PokerStars Blog here. Top prize won by Steve O’Dwyer in the $10,000 PokerStars Championship Panama High Roller. O’Dwyer beat a field of 110 players to claim the biggest payout from the $1,067,000 prize pool. PokerStars New Jersey had its first birthday on Tuesday, March 21 - a year during which it has run 40 player promotions for Garden State players. The birthday celebrations are in full swing with a range of innovative promotions on offer to suit players of all levels. The schedule for the month-long PokerStars NJ party has just nudged past the halfway point, but there’s still plenty of fun, cash and opportunities to win - and to win big - at PokerStarsNJ.com. KidPoker, a PokerStars Original Films documentary, has placed 27th in The Telegraph’s 33 best sports films and TV shows on Netflix list. The feature-length documentary chronicles the life and career of the world’s greatest – and most outspoken – poker player, Team PokerStars Pro Daniel Negreanu. BetStars is sponsoring seven-time snooker World Champion Stephen Hendry as he takes on fellow snooker legends and qualifiers in the Super Star Online World Seniors Championship snooker tournament. The winner will pocket £10,000 and a wildcard entry into the World Snooker Championship at The Crucible next month. The biggest poker event Russia has ever seen will take place at the Sochi Casino & Resort from May 20-31, 2017. Players in Russia have the chance to Spin & Go For Free to the inaugural PokerStars Championship Sochi Main Event. PokerStars Championship heads to Macau. The event will be held at the City of Dreams and will run from March 30 - April 9.